Yellow-and-Black licensed Beijing Taxi on the 3rd ring road in front of the Ancient Beijing Observatory. If you ever wondered about Beijing Taxi's, wonder no more !! Beijing is one of the easiest Cities in the World to get a really decent Cab in, and its cheap too. 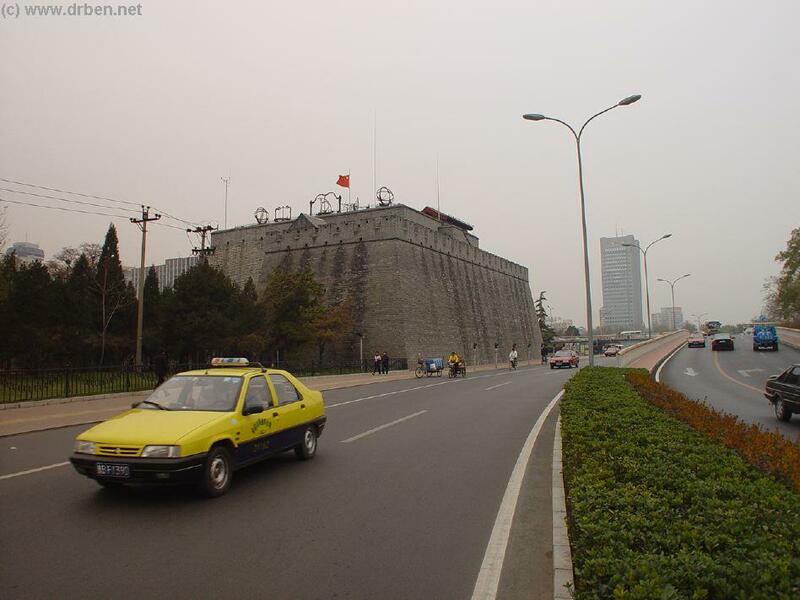 Written by Doc Ben, a very experienced Beijing Cab Passenger himself, here is the answer to most , if not all , of your questions about Taxi Transportation in the City of Beijing. First of All : As mentioned , Beijing is one of those Cities it is really easy to get a decent and pleasant Cab-ride in. Really, it is easy. Cabs are all around !! Even at night-time, especially when walking around as a foreigner, taxi's will break to see if you are looking for a ride. Only during rainstorms, or public holiday rush-hour getting a taxi may take more time. Our instructions on this page are therefor minimal. Just stick to the do's and don'ts ... and you should be able to stay out of any trouble and get to your desired destination. Where to get a Cab : In Beijing you can basicly get a Cab almost anywhere. Since ( mostly ) the Red Taxi's are so abundant , they cruise around almost every part of the City all day. Therefor - Taxi's will simply roll by, even if you are on a smaller street. You might even get lucky in the Hutong ! China is a country of huge competition in the Labour Market. You may imagine. Cab-drivers therefor drive for a low fair and will go through considerable trouble ( and length ) find and deliver a customer. The Basics : Basics of Beijing Taxi's are of course which Cab to get, and which not. My first advise would be to always take notice of Taxi colors. 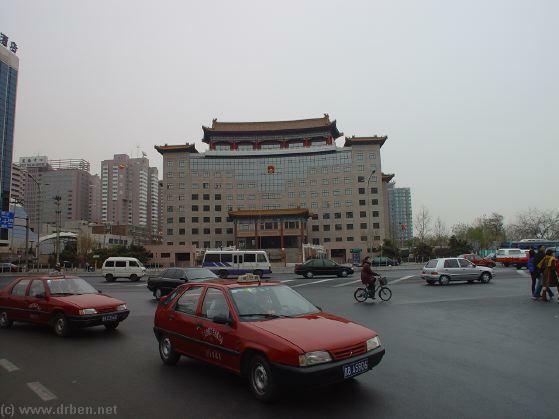 Red Taxi's , so called " Bullet ( Xiali ) Taxis " are the cheapest and easiest Taxi transport in Beijing. Red Taxi's are also the most common in Beijing and are always officially licensed as you can check immediately by the large card with photograph of the driver on the dash-board. These caracteristics - together with the Taxi-Meter below the License Card are the Hallmarks of a truly trustable Beijing Taxi. Last but not least- the taxi's rate are displayed on the exterior using another sticker. Get these three together in one taxi, and things can hardly go wrong. All in the blink of an eye. Just to be complete. There are many other perfectly good Taxi's in Beijing, in other colors then the above Red. As shown on this page green-an-white , black-and-yellow, and even glossy black Taxi's of the same high quality are also available but are ( still?) far fewer in number. The larger the Taxi , the higher the yuan-per-mile rate. Rates vary from 1.4 yuan / kilometer for Red Taxis, to yuan 2.0 per kilometer for large glossy taxi's (risen in 2005). The rate is displayed on the red license sticker each registered Cab has. The most standard and common Beijing Taxi - Red. The Red Xiali Bullet Taxis are Always okay and licensed. Maybe you have heard the rumors too - Hijacking, mugging, over-charging, detours ?? Please don't believe too much of these stories. I never noticed anything like that on my travel to and through China and I am pretty much aware what happens or happened. Indeed, the only risk you take is an unlicensed Cab or a pre-arranged price that turns out to be really generous of you. Where not to get a Cab : Where not to get a Cab is really hard to say. First of all I have never personally had any real problems. On the contrary - more than once a driver took me to a wrong destination just a minute away from my original one, and refused to take any payment. Secondly, most drivers are decent hardworking Men- and Women, who take pride in the cleanliness of their car and speedy service. So ? Disregard any rumours about Taxi-kidnappings, luggage robbings etc and relax. Those are uncommon. The only adverse thing you may come across is paying double-fair on a taxi-ride from Capital Airport. The airport attracts fake- and non-fake taxi drivers looking for an uninformed sucker who isn't familiar with the fares, yet. Although authorities actively work against them inevitably some slip through, at least for a while. Other notorious spots are, ofcourse, late-night bars, cafe's and nightclubs. Here, drivers may be looking for drunks to squeeze for their last money. Sure, you may get an un-licensed Cab, but that would be looking for trouble. Don't take it !! Maybe its just a guy earning an extra , but if you get unlucky anything might happen. Don't make yourself stress-out by taking the risk. The next taxi is already around the corner. Best Tips - 1) Get a Cab at your Hotel. This way the Doorman or Concierge at the Hotel can translate your destination to the driver, and this may avoid any mis-communications. After this you will have a better drive. 2) If you don't or just anway - As most drivers still have difficulty communicating in English, for exotic destinations , I advise to bring a map of your destination area. This way - if a problem occurs or they head the wrong way ( with you along ) , you can simply point your destination out to the driver. If you have chinese names on your map you are a champ ! 3) Be sure you have a licensed cab with a working taxi-meter. No meter , no go. 4) Don't be fooled into a pre-arranged price. At tourist-sites drivers may come up to you and offer a price. 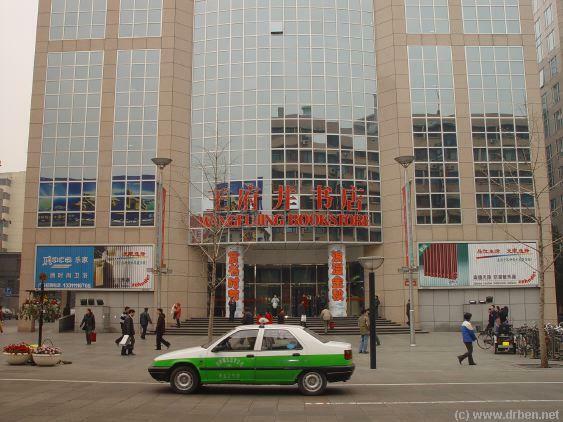 If you are not familiar with the low prices in Beijing, you may be fooled and pay double of zilch. Ooooh well, get over it and learn ! A Beijing Taxi Receipt - I payed about ten yuan, which is about 1 Euro, making this the cheapest transport in Beijing next to the Subway / Metro. Green-and-White licensed Beijing Taxi at Wanfujing Street Book Store. I asked it to wait. out-lying tourist destinations, you may get a personal business-card from your Driver. Most of the times it is possible to book a Taxi, even for one or more days. If you negotiate a good price, you may travel just about anywhere. Be realistic; it will not be a mere 10 yuan that time. But you are assured of excellent service, such as belongs to the past in most European Cities. Latest development - As part of the plans to reduce late-night traffic and noise, the city is attempting to reduce the number of Taxi's loitering the streets late at night for customers. If this will be a success at all is still a big question. Other measures taken include the introduction of taxi-stands and special parking zones for taxi's. In the near future it will also be made more convenient and easy to order a taxi to any address, using telephone. Telephone orders were a feature long unknown to Chinese Cities and certainly to Beijing. If you hire a Cab : Rates in November 2004 were - 1 Day = 500 rmb. Half a Day 300 to 350 rmb. Depending on how sharp you would like to Bargain. Rates had risen by 15% by June of 2005. Quality of Cars - Excellent. A chinese model Audi is the standard at the moment. Especially if you hire a Cab for longer , keep your driver happy. Most drivers will find it highly unusual if you show interest in them. And I do not mean talking. Give them a coffee every now and then. Smokes can wonders to keep drivers patient and happy. However, others may wish to keep their car clean and neat. Be nice and get the best money can buy? A good deal in Beijing. Have Fun meanwhile at the Great Wall, the Western Qing Tombs or other far destinations. The Summer Palace Museum at the very North-Western border of Haidian District is now reachable by the New Yellow Subway Line , which travels further to Olympic Park. No Cab's needed there. 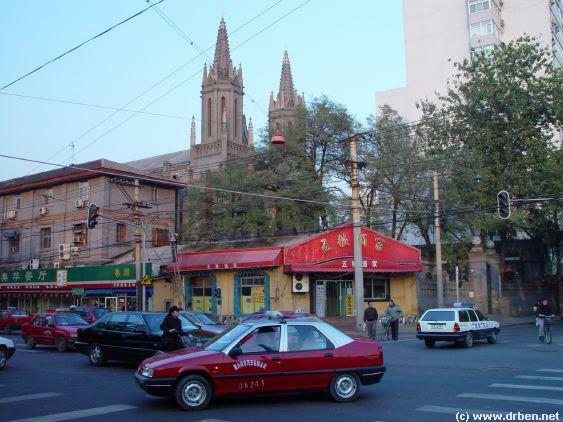 Modified Red licensed Beijing Taxi at the St. Mary's Church, part of the former Foreign Legation Quarter, in the South of DongCheng District.